Urns | Shared Sorrows: Caring People, Resources and More. Our Cloisonne cremation urn will stand as a timeless memorial, urn and extraordianry work of fine art. Handcrafted from copper and wire designs and using ancient Chinese techniques, where hand-applied enamel glaze, of all colors, is painted on the urn, fired until smooth and glossy, making each urn a uniquely beautiful memorial. This technique reached its perfection as a result of the Chinese artisans. The final product is an exquisite sturdy cremation urn that will last for generations and generatons. Our Cloisonne urn will stand as a timeless memorial, urn and extraordinary work of fine art. Created from handcrafted copper and brass wire designs and using ancient Chinese techniques, where hand-applied enamel glaze, of all colors, is painted on the urn, fired until smooth and glossy, making each urn a uniquely beautiful memorial. This technique reached its perfection as a result of the efforts of Chinese artisans. The final product is an exquisite sturdy cremation urn that will last for generations and generations. Our Cloisonne cremation urn will stand as a timeless memorial, urn and extraordinary work of fine art. Handcrafted from copper and brass wire designs and using ancient Chinese techniques, where hand-applied enamel glaze, of all colors, is painted on the urn, fired until smooth and glossy, making each urn a uniquely beautiful memorial. This technique reached its perfection as a result of the efforts of the Chinese artisans. The final product is an exquisite sturdy cremation urn that will last for generations and generations. Star Legacy's Athena Bronze Heart Keepsake is individually hand-crafted using a sand casting process that is hundreds of years old. Our handcrafting provides each urn with its own uniqueness and variation in color, finish and engraving -- the Athena Bronze Heart Keepsake is made of 100% brass and brushed to a beautiful bronze finish. The Heart employs a double screw lock to secure its valuable contents. Ideal for home or columbarium. The Athena Bronze Heart Keepsake is part of a collection that includes Adult/Large and Keepsake sizes, available separately. A beautiful velvet gift box is included with each Heart Keepsake. Made of 100% Brass, the Athena Bronze Heart Keepsake holds up to 5 cubic inches of cremated remains (one pound weight PRIOR to cremation equals 1 cubic inch). The Heart Keepsake's dimensions are 2.9 inches high x 2.7 inches in diameter. Due to the personal nature of this product we do not accept returns. Star Legacy's Athena Pewter Heart Keepsake is individually hand-crafted using a sand casting process that is hundreds of years old. Our handcrafting provides each urn with its own uniqueness and variation in color, finish and engraving -- the Athena Pewter Heart Keepsake is made of 100% brass and brushed to a beautiful bronze finish. The Heart employs a double screw lock to secure its valuable contents. Ideal for home or columbarium. The Athena Pewter Heart Keepsake is part of a collection that includes Adult/Large and Keepsake sizes, available separately. A beautiful velvet gift box is included with each Heart Keepsake. 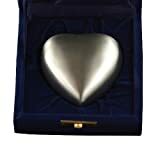 Made of 100% Brass, the Athena Pewter Heart Keepsake holds up to 5 cubic inches of cremated remains (one pound weight PRIOR to cremation equals 1 cubic inch). The Heart Keepsake's dimensions are 2.9 inches high x 2.7 inches in diameter. Due to the personal nature of this product we do not accept returns. Star legacy's Black Gold Heart Keepsake is made of solid brass and finished in a high gloss finish that matches the brass highlights in the other pieces in the collection. The keepsakes have a double screw bottom for easy handling. The Black Gold series is individually hand-crafted using a sand casting process that is hundreds of years old. Our handcrafting provides each urn with its own uniqueness and variation in color, finish and engraving. Ideal for home or columbarium; and, shipped with a velvet gift box. Simply beautiful, the Black Gold Heart is a lasting tribute that honors your loved one for all of time. The Black Gold Heart is part of a collection that includes an Adult/Large and Keepsake size, available separately. Made of brass the Black Gold Heart holds up to 5 cubic inches of cremated remains (one pound weight PRIOR to cremation equals 1 cubic inch. Dimensions:2.9 inches high x 2.7 inches. Due to the personal nature of this product we do not accept returns. Star Legacy's Moonlight Eclipse Heart is individually hand-crafted and is a perfect match to the rest of the collection. Our handcrafting provides each Heart with its own unique variations in color, finish and engraving. The Moonlight Eclipse Heart is made of brass and has a dual screw- back lid for easy handling. It's ideal for home or columbarium. The Moonlight Eclipse Heart is part of a collection that includes a Large/Adult and Keepsake, available separately. A velvet gift box is included. Made of brass the Heart holds up to 5 cubic inches of cremated remains (one pound weight PRIOR to cremation equals 1 cubic inch. Dimensions: 2.9 inches high x 2.7 inches in diameter. Due to the personal nature of this product we do not accept returns. Star Legacy's Sky Blue Radiance Heart is a stunning memorial, majestic in its appearance. The Classic Radiance series is made of brass, finished in blue lacquer and engraved by hand to show beautiful brass details. The contrasting richness of the black and polished brass makes this a work of art that stands distinguished in any setting. The Heart employs a double screw lock to secure its valuable contents. 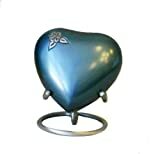 Ideal for home or columbarium, the Sky Blue Radiance Heart is individually hand-crafted using a sand casting process that is hundreds of years old. Our handcrafting provides each heart with its own uniqueness and variation in color, finish and texture. The Heart ships in a velvet gift box. Simply beautiful, the Sky Blue Radiance Heart is a lasting tribute for all of time and is part of a collection that includes an Adult/Large Urn and Keepsake available separately. Made of 100% Brass, the Heart holds up to 5 cubic inches of cremated remains (one pound weight PRIOR to cremation equals 1 cubic inch. Dimensions: 2.9 inches high x 2.7 inches in diameter. Due to the personal nature of this product we do not accept returns. Star Legacy's Sparkling Auburn Heart is individually hand-crafted. The Sparkling Auburn Keepsake is as magnificent as it is beautiful with its antique-bronze, hand-engraved base, lid and shoulder set against a sparkling auburn, high gloss metallic enamel finish. Our handcrafting provides each heart with its own unique variation in color, finish and engraving. The Sparkling Auburn Heart is made of brass and has a dual screw back lid for easy handling. The Sparkling Auburn Heart is part of a collection that includes a Large/Adult and Keepsake, available separately. A velvet gift box is included. The Sparkling Auburn Heart is made of brass and holds up to 5 cubic inches of cremated remains (one pound weight PRIOR to cremation equals 1 cubic inch. Dimensions: 2.9 inches high x 2.7 inches. Due to the personal nature of this product we do not accept returns. Star Legacy's Sparkling Indigo Heart is individually hand-crafted. The Sparkling Indigo Heart is as magnificent as it is beautiful with its antique-bronze, hand-engraved base, lid and shoulder set against a blue indigo, high gloss metallic enamel finish. Our handcrafting provides each heart with its own unique variation in color, finish and engraving. The Sparkling Indigo Heart is made of brass and has a dual screw back lid for easy handling. The Sparkling Indigo Heart is part of a collection that includes a Large/Adult and Keepsake, available separately. A velvet gift box is included. 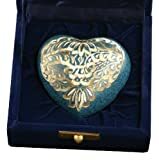 The Sparkling Indigo Heart is made of brass and holds up to 5 cubic inches of cremated remains (one pound weight PRIOR to cremation equals 1 cubic inch. Dimensions: 2.9 inches high x 2.7 inches. Due to the personal nature of this product we do not accept returns. Star Legacy's Sparkling Pearl Heart is individually hand-crafted. The Sparkling Pearl Heart is as magnificent as it is beautiful with its antique-bronze, hand-engraved base, lid and shoulder set against a pearl white, high gloss metallic enamel finish. Our handcrafting provides each heart with its own unique variation in color, finish and engraving. The Sparkling Pearl Heart is made of brass and has a dual screw back lid for easy handling. The Sparkling Pearl Heart is part of a collection that includes a Large/Adult and Keepsake, available separately. A velvet gift box is included. The Sparkling Auburn Heart is made of brass and holds up to 5 cubic inches of cremated remains (one pound weight PRIOR to cremation equals 1 cubic inch. Dimensions: 2.9 inches high x 2.7 inches. Due to the personal nature of this product we do not accept returns. Star Legacy's Turquoise Granite Heart offers the spirit of the American Southwest in this deeply textured and richly painted brass heart. Finished in the colors that make turquoise so unique -- enhanced with polished brass -- this urn reflects the spirit and love that exists through endless time. The Heart is individually hand-crafted using a sand casting process that is hundreds of years old. Our handcrafting provides each heart with its own uniqueness and variation in color, finish and appearance. The Turquoise Granite Heart is made of 100% brass and enhanced with an electroplated turquoise finish. The Heart has a dual screw- back lid for easy handling. The Turquoise Granite Heart is part of a collection that includes a Large/Adult and Keepsake, available separately. A velvet gift box is included. Made of 100% Brass the Turquoise Granite Heart holds up to 5 cubic inches of cremated remains (one pound weight PRIOR to cremation equals 1 cubic inch. Dimensions: 2.8 inches high x 1.7 inches wide. Due to the personal nature of this product we do not accept returns. Star Legacy's Twilight Purple Heart is individually hand-crafted and is a perfect match to the rest of the collection. Our handcrafting provides each Heart with its own unique variations in color, finish and engraving. The Twilight Purple Heart is made of brass and has a dual screw- back lid for easy handling. It's ideal for home nor columbarium. The Twilight Purple Heart is part of a collection that includes a Large/Adult and Keepsake, available separately. A velvet gift box is included. Made of brass the Heart holds up to 5 cubic inches of cremated remains (one pound weight PRIOR to cremation equals 1 cubic inch. Dimensions: 2.9 inches high x 2.7 inches in diameter. Due to the personal nature of this product we do not accept returns. Uplifting. Light. And free as a bird. These are the emotions and thoughts that best describe our Wings of Freedom Keepsake Heart. The Wings of Freedom Heart is hand-engraved with a gloriously painted 'wings of freedom' design upon a polished nickel-plated finish. The heart is individually hand-crafted using a sand casting process that is hundreds of years old and made of 100% brass. Our handcrafting provides each Wings of Freedom with its own uniqueness and variation in color, finish and engraving. The Heart employs a double screw lock to secure its valuable contents. The Wings of Freedom Heart is part of a collection that includes an Adult/Large, and Keepsake, available separately. Ideal for home or columbarium. Made of brass the Wings of Freedom Heart holds up to 5 cubic inches of cremated remains (one pound weight PRIOR to cremation equals 1 cubic inch. Dimensions: 2.9 inches high x 2.7 inches width. Due to the personal nature of this product we do not accept returns. Star Legacy's American Flag Brass Keepsake is made of solid brass and proudly displays Old Glory waving free. The keepsake is hand-crafted using a sand casting process that is hundreds of years old. Our handcrafting provides each urn with its own unique variation in color, finish and engraving. The theme is patriotic and our Flag is enhanced with a blue/gray granite background symbolizing all parts of America. The Keepsake has a screw top for easy use, and the American Flag Keepsake is ideal for home, scattering, columbarium, or burial. The Keepsake has a companion Large/Adult size, available separately. Made of 100% Brass the Keepsake holds up to 3 cubic inches of cremated remains (one pound weight PRIOR to cremation equals 1 cubic inch. (NOTE: A keepsake only holds a nominal amount of ashes and will NOT hold an entire person's remains.) Dimensions: 2.4 inches high x 1.7 inches in diameter. Due to the personal nature of this product we do not accept returns. Star Legacy's Athena Bronze Brass Keepsake is individually hand-crafted using a sand casting process that is hundreds of years old. Our handcrafting provides each keepsake with its own uniqueness and variation in color, finish and engraving -- the Athena Bronze Keepsake is made of 100% brass and brushed to a beautiful bronze finish. (NOTE: A keepsake only holds a nominal amount of ashes and will NOT hold an entire person's remains.) The Keepsake has three hand- engraved leaf designed bands filled in black with a screw- top lid for easy handling. Ideal for home, columbarium, burial or scattering. The Athena Bronze Keepsake is part of a collection that includes an Adult/Large size and Keepsake Heart, available separately. A velvet bag is included with each Keepsake. The keepsake holds up to 3 cubic inches of cremated remains (one pound weight PRIOR to cremation equals 1 cubic inch. Dimensions: 2.8 inches high x 1.7 inches in diameter. Due to the personal nature of this product we do not accept returns. 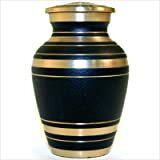 The Black Gold Brass Keepsake Urn is an stunning keepsake and majestic in its appearance. Star Legacy's Black Gold Collection is made of brass and has a durable matte black finish with several brass band highlights. The contrasting richness of the black and polished brass makes this a work of art that stands distinguished in any setting. The keepsake has a screw- top lid for easy handling. The Black Gold Keepsake is individually hand-crafted using a sand casting process that is hundreds of years old. Our handcrafting provides each urn with its own uniqueness and variation in color, finish and texture. Ideal for home, columbarium, scattering, or burial. (NOTE: A keepsake only holds a nominal amount of ashes and will NOT hold an entire person's remains.) Simply beautiful, the Black Gold Keepsake is a lasting tribute for all of time. Black Gold Keepsake is part of a collection that includes an Adult/Large and Keepsake Heart, available separately, and ships with a velvet bag. Made of 100% Brass the Keepsake has a user friendly screw top lid and holds up to 3 cubic inches of cremated remains (one (1) pound weight PRIOR to cremation equals 1 cubic inch). Dimensions: 2.7 inches high x1.7 inches in diameter. Due to the personal nature of this product we do not accept returns. Star Legacy's Gray Rock Granite Brass Keepsake offers the spirit of the American terrain in this deeply textured and richly painted brass urn. Finished in gray pebbled colors -- enhanced with polished brass -- this urn reflects the spirit and love that exists through endless time. The Keepsake is individually hand-crafted using a sand casting process that is hundreds of years old. Our handcrafting provides each keepsake with its own uniqueness and variation in color, finish and appearance. The Gray Rock Granite Keepsake is made of 100% brass and enhanced with an electroplated gray pebbled finish. The keepsake has a screw- top lid for easy handling. (NOTE: A keepsake only holds a nominal amount of ashes and will NOT hold an entire person's remains.) The Gray Rock Granite Keepsake is part of a collection that includes a Large/Adult and Keepsake Heart, available separately. A velvet bag is included. Made of 100% Brass the Adult/Large holds up to 3 cubic inches of cremated remains (one pound weight PRIOR to cremation equals 1 cubic inch. Dimensions: 2.8 inches high x 1.7 inches in diameter. Due to the personal nature of this product we do not accept returns. Star Legacy's Midnight Radiance Keepsake is an stunning urn, majestic in its appearance. The Classic Radiance series is made of brass, finished in black lacquer and engraved by hand to show beautiful brass details. The contrasting richness of the black and polished brass makes this a work of art that stands distinguished in any setting. The urn has a screw- top lid for easy handling. The Midnight Radiance Keepsake is individually hand-crafted using a sand casting process that is hundreds of years old. Our handcrafting provides each urn with its own uniqueness and variation in color, finish and texture. Ideal for home, columbarium, or scattering. Simply beautiful, the Classic Radiance Keepsake is a lasting tribute for all of time and is part of a collection that includes an Adult/Large Urn and Keepsake Heart available separately. (NOTE: A keepsake only holds a nominal amount of ashes and will NOT hold an entire person's remains.) Made of 100% Brass, the keepsake holds up to 3 cubic inches of cremated remains (one pound weight PRIOR to cremation equals 1 cubic inch. Dimensions: 2.4 inches high x 1.7 inches in diameter. Due to the personal nature of this product we do not accept returns. Star Legacy's Moonlight Eclipse Keepsake is individually hand-crafted and features three hand-engraved, modern leaf bands. The collection features two tone, blue/gray textured finishes between its top and body capturing the night time sky. Our handcrafting provides each keepsake with its own unique variations in color, finish and engraving. The Moonlight Eclipse Keepsake is made of brass and has a screw- top lid for easy handling. (NOTE: A keepsake only holds a nominal amount of ashes and will NOT hold an entire person's remains.) It's ideal for home, columbarium, burial or scattering. The Moonlight Eclipse Keepsake is part of a collection that includes a Large/Adult and Keepsake Heart, available separately. A velvet bag is included. Made of brass the Keepsake holds up to 3 cubic inches of cremated remains (one pound weight PRIOR to cremation equals 1 cubic inch. Dimensions: 2.8 inches high x 1.8 inches in diameter. Due to the personal nature of this product we do not accept returns.